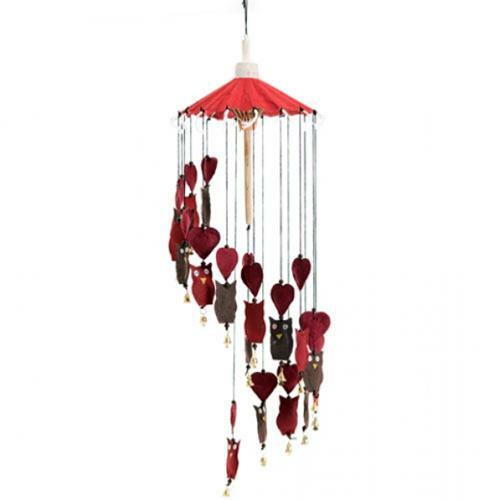 Red and brown mulberry paper mobile umbrella with spokes hung with owls and hearts, finished with tiny bells. Hand made using traditional techniques. Known as Mulberry paper, the raw material is sourced from the Mulberry tree, which is fast growing and commonly found in Southeast Asia. With its long fibres, the bark is perfect for making pulp which results in a stronger and more durable product than often found in other papers, whilst still remaining lightweight.